A permaculture design workshop taught by Jesse Watson of Midcoast Permaculture and hosted by MFT at the Joseph A. Fiore Art Center, Jefferson. While many of us think of fields and forests as separate places, food forests are systems that combine the production goals of agriculture with the layered and dynamic patterns we see in the forest. Explore this concept and practice its applications with Maine Farmland Trust and Jesse Watson of Midcoast Permaculture Design during a weekend Food Forest Design Intensive, May 4-6, 2018 at the Joseph A. Fiore Art Center at Rolling Acres Farm in Jefferson. The Fiore Art Center and Veggies For All, both programs of MFT, have been working together for the past two years to envision a collaboration which would bring back active farming to Rolling Acres Farm, while simultaneously allowing for possible diversification of Veggies For All. The workshop will focus on design and implementation of a hypothetical “food bank food forest” at the art center, using permaculture as the basis for our design. Permaculture is a design method and set of techniques for creating resilient human habitats while increasing ecosystem health. It is a synthesis of wise human behavior taken from both modern and ancient sources of inspiration. Students often come away from our workshops with new ways of seeing, thinking, and acting in the world. We strive to give participants in our workshops a positive vision for the future and practical tools to make it so. 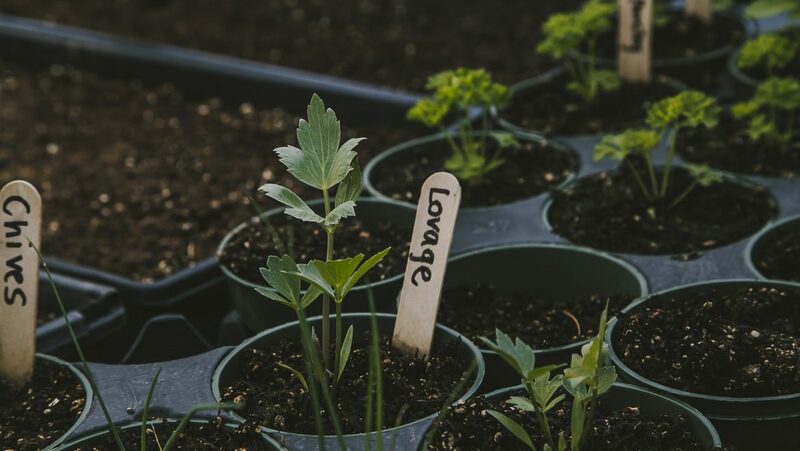 This course is good for beginners and seasoned gardeners alike. Orchardists, nursery people, and farmers interested in perennial crops will take a special interest in this alternative way of designing a perennial-based system. Arrival is scheduled for Friday evening: 4-5:30 pm. The course ends Sunday afternoon at 4 pm. The workshop fee of $335 per person includes tuition, lodging in shared rooms, as well as all meals (except for our Friday evening potluck). Expected number of course participants: 10-18. MFT members receive a 10% discount off the Regular Fee. The scholarship positions for this course have been filled. Please contact anna@mainefarmlandtrust.org to inquire about alternatives. For more information, contact Anna Witholt Abaldo, co-director of the Fiore Art Center by e-mail at anna@mainefarmlandtrust.org or call 207-338-6575, ext. 112. 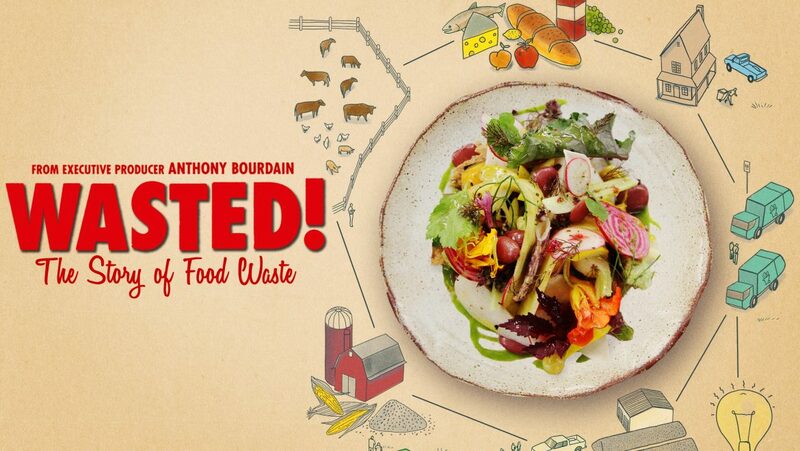 Join MFT, Veggies For All & Unity Barn Raisers for a FREE screening of the new film, Wasted! Every year 1.3 billion tons of food is thrown away. Wasted! explores the reasons for this waste and ways to fix the problem. Wednesday, Sept. 6, Jock Robie from Mainely Worm Bins will be coming to Unity to lead a workshop on worm bins! He is an amazing wealth of knowledge on the topic of Vermiculture and how to care for your voracious red wigglers. He will be bringing all of the materials for ten worm bins to give away for FREE! Nine of those bins will go to the first nine participants to arrive and one will be held for a name-draw at the end. No need to bring anything more than yourself and possibly a notebook for taking notes. Snacks and juice will be available during the event. You can find more details below. What: How to build and care for a home worm bin! What is a worm bin?! A home or office worm bin is a fantastic way to make use of kitchen scraps, old newspaper, leaves, and many other materials within a worm’s diet. When properly cared for, the bins do not emit an odor and the worms stay put in their happy homes! 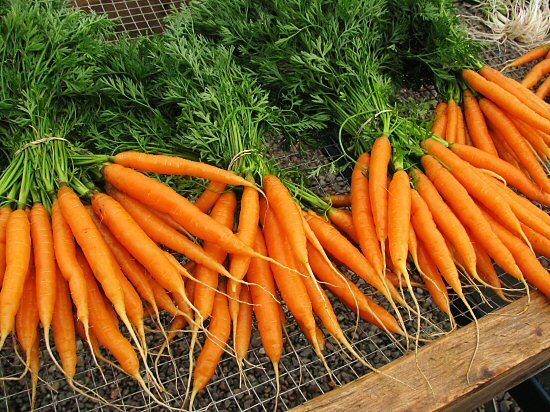 After just a short time, typically 3-4 months, the nutrient rich worm castings can be harvested and added to your home garden or indoor plants. Join us next Wednesday to learn more! Jock Robie has many useful answers and suggestions as well as a very clever and replicable worm bin design. Unity Barn Raisers and Veggies For All present Empty Bowls 2017, a benefit for the Volunteer Regional Food Pantry and the Western Waldo County Gleaning Initiative. Due to inclement weather the date has been changed from Tuesday, March 14, to Wednesday March 15, from 5 to 7 p.m. at Maine Farmland Trust’s Unity Food Hub, 69 School St. The public is invited to enjoy a simple soup dinner, take home a beautiful bowl and support hunger relief in the Unity area. Soups feature local ingredients sourced through the Unity Food Hub and are appropriate for a variety of dietary needs. Suggested donation of $10.00. This event is sponsored by UniTel and supported by potters from Unity Pond Pottery, Unity College art department and others around the state. For more information or to make a donation, contact Mary Leaming of Unity Barn Raisers, at 948-9005 or programs@unitybarnraisers.org. The Volunteer Regional Food Pantry is a 501(c)(3) community-operated food pantry providing emergency and supplementary food and services to those at risk of hunger in the Unity, Maine area. The goal of the VRFP is to increase quality of life through a focus on food security. Unity Barn Raisers works pro-actively to enhance small-town character and rural environment, while nurturing a thriving community-based economy. UBR believes that a community working together can shape its own future and, in so doing, significantly advance the quality of life of its people, both now and for generations to come. 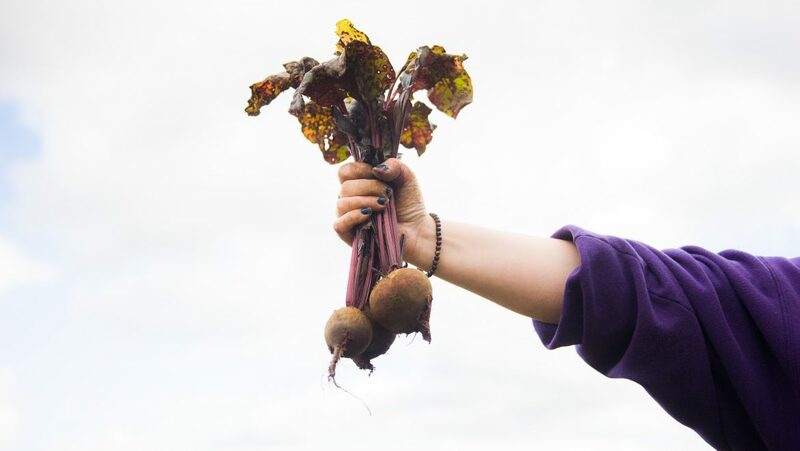 Veggies For All, a project of Maine Farmland Trust, is a food bank farm that works to relieve hunger by growing vegetables for those in need, while collaborating with partners to distribute and increase access to quality and nutritious food. 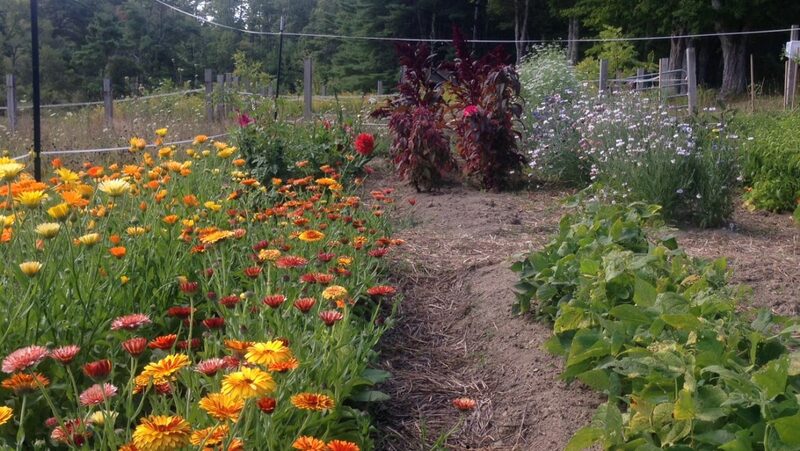 FEEDING MAINE: growing access to good food. FEEDING MAINE is a traveling photo exhibit documenting some of the many people working for change in our communities across the state, with the hope that these efforts will continue to grow into a resilient food system that serves all Mainers. Photography by Brendan Bullock. Captions by Annie Aviles. Plus hear from community leaders, from farm to food pantry, about innovative projects that address hunger in our state using local resources: rich farmland, skilled farmers, and community support. Time for networking & snacks provided! Exhibit produced by: Maine Farmland Trust and Good Shepherd Food Bank of Maine. 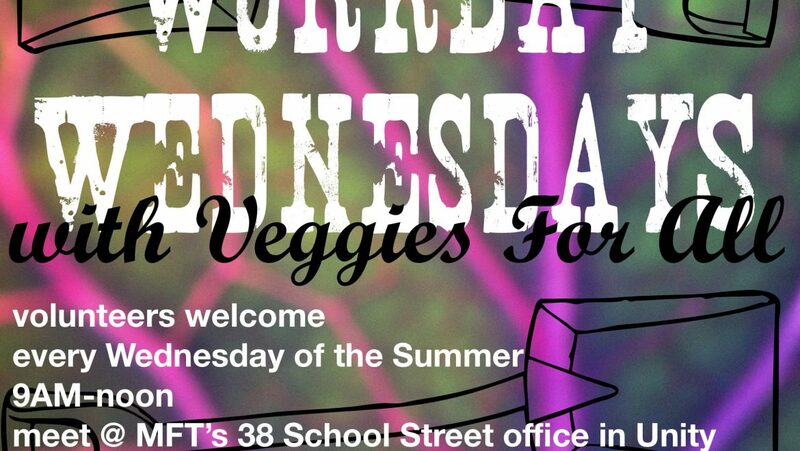 With: Food And Medicine, Veggies for All and other local food access projects! If you see the phrase “food insecurity,” you might picture scenes from distant places hit by the global food crisis: barren fields marked by drought, families fleeing wars, or people waiting in long ration lines. You might not picture Maine. Yet more than 200,000 Mainers are food insecure. The term means hunger and scarcity; it also means lack of access to food that’s fresh and healthy. Meeting that need for good food is where Maine’s farmers, workers, and volunteers come in. Our state already has the elements required to feed everyone who lives here: farmland, farmers, and people who are invested in forging ties between farms and low-income Mainers. By making fresh ingredients accessible to those who need them most, the projects featured here are also creating new opportunities for local farms—by opening up markets, diverting waste through farm donations and gleaning, and creating new customers by helping people learn to keep home gardens and cook with fresh ingredients. This series is part of a larger photo project that seeks to document some of the many people working for change in their communities, with the hope that these efforts will continue to grow into a resilient food system that serves all Mainers. A joint collaboration between Maine Farmland Trust and Good Shepard Food Bank, the photo project will be shown around the state beginning in September 2015. Veggies For All volunteers join in the harvest. They come from all over: this group includes Unity College students, volunteers from local food pantries, and VFA staff. From left to right: John Hoeltzel, Tim Libby, Anna Mason, and Trevanna Grenfell. lugs a crate of beets to a truck during the Veggies For All Harvest Party. This past spring, Jim gave CSA members a special deal on share prices if they donated $25 to VFA; during the harvest party, he and his farm crew helped kick-start the event by donating their time to work with volunteers. Also pictured in the background are: Kelsey Schrey, a member of Jim Buckle’s crew, and Sara Trunzo, VFA director. as part of job training through the Youth Powered Catering program (YPC) run by St. Mary’s Nutrition Center. Abdullahi is a senior at Lewiston High School, and plans to attend college after graduation. At YPC, he enjoys learning to prepare dishes from all over the world. “Before, I didn’t really know that healthy food could also be delicious,” he says. “And learning how to cook is handy because everyone needs to eat.” Abdullahi also participates in St. Mary’s urbanfarming program, and works at the year-round farmers market in Lewiston, which St. Mary’s helped create. Earlier this year, we teamed up with Free Range Music Series to kick-off of Veggies for All’s 9th year of hunger relief with a breathtaking performance by William Joseph Jiordan and Henry Finch. Seems only natural to celebrate the end of the season with a rip-roarin’ party. Hymn for Her are on the road with their new album, Drive Til U Die, and are going to detour through Unity to help us do this up right! About the Band: Hymn for Her is Lucy and Wayne Waxing. Their newest release Drive Til U Die is more than an album title, it’s a manifesto. A mantra. But to call this Americana duo and their daughter road warriors would be a misnomer; to them, the road isn’t a battleground to conquer, it’s their beloved home. A nomadic tribe of three, they dwell in a ’61-vintage Bambi Airstream towed by a Ford van whose odometer shows nearly half a million miles – which, they proudly note, equals a trip to the moon. And back. Please join us in Unity to celebrate the harvest, welcome new faces and appreciate the old standbys, and mark the sweetness of the season. TICKETS: $10.00 in advance, $12.00 at the door. The warm late summer has meant that our onion crop is drying quickly, turning the hundreds of pounds of onions we pulled a couple weeks ago into high quality storage vegetables that will keep well into the winter. We’ve also been busy harvesting peppers, carrots, and beets. All in all, we’ve raised and distributed over 3,600 lbs. of food so far this season thanks to the help of dozens of volunteers, and we’re really just getting started. 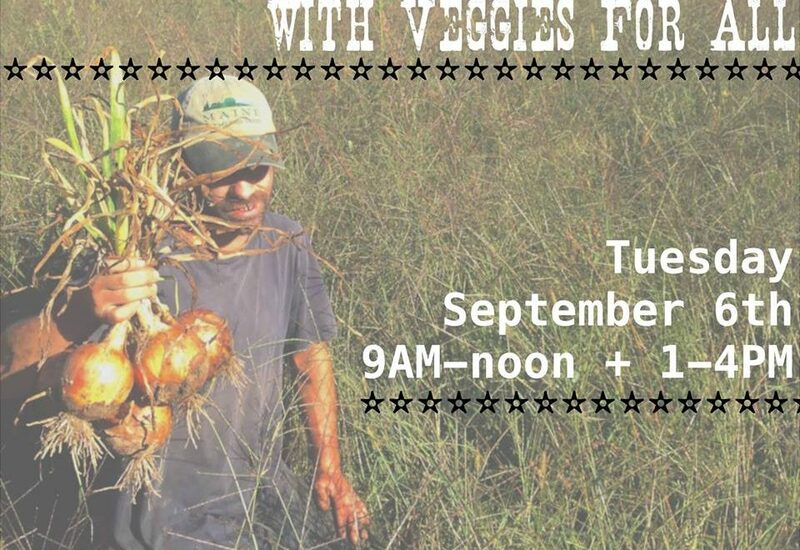 Help us keep the harvest rolling by joining us next Tuesday 9/27 from 9 a.m. to noon for trimming our storage onions. Workday is presumed on, rain or shine. For onion trimming we’ll be working in a greenhouse that’s likely to be very warm. Please dress appropriately and bring whatever you need to be comfortable in that day’s conditions. If you have any questions, please call 207-322-1366 or e-mail kflack@mainefarmlandtrust.org. Directions: head south from Unity on Albion Rd. about five miles until you see Waning Rd. on your left. Turn onto Waning Rd. then make your first (immediate) right into Grady Place. Follow the driveway toward and through the apple trees. You’ll see large greenhouses on your left. We’ll be in the one in the center. If you’re using a GPS, the address is 1059 Albion Rd. Thanks so much for your support. Hope to see you soon! 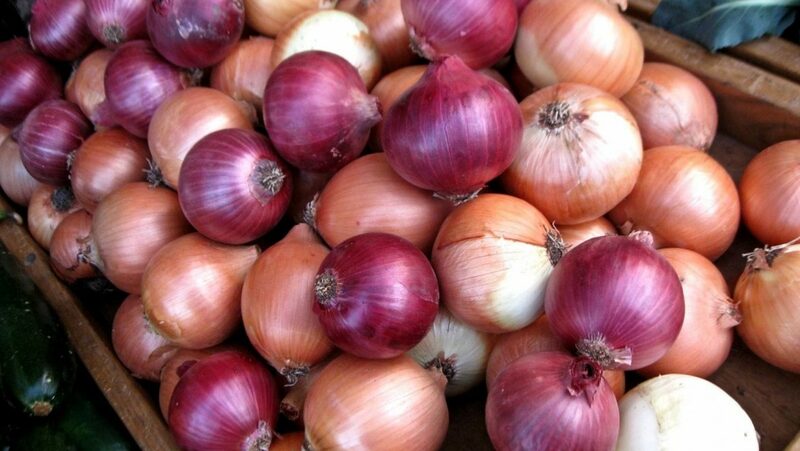 Join us at our School St. field TUESDAY 9/6 to bring in one of our best looking onion crops in recent memory. We have about 10,000 of them to pull and set to cure, so however you do the math, we need LOTS of hands to help. We’ll be working from 9 a.m. to Noon and 1 p.m. to 4 p.m. Please do not arrive expecting to work between noon and 1, as our crew and other volunteers will all be taking a well deserved break/lunch during that time. This event is ON rain or shine. Please bring whatever you need to be comfortable in that day’s conditions. Each Wednesday throughout the growing season Veggies For All is welcoming volunteers to lend a hand toward the harvest from 9 a.m. to Noon. 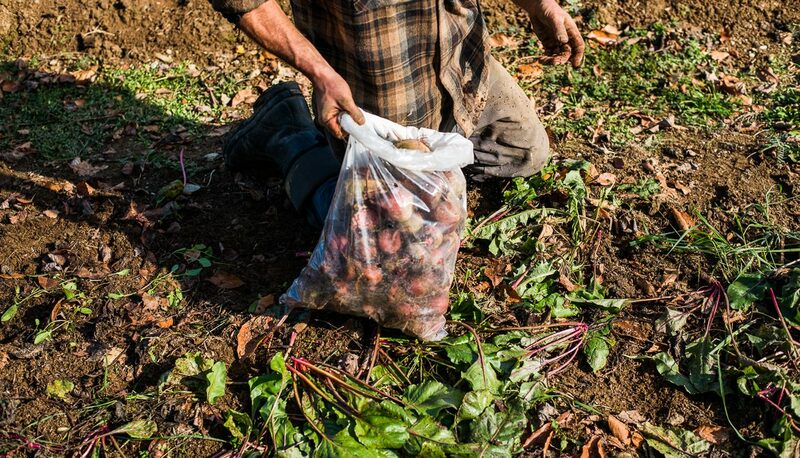 Tasks vary week to week, and could include planting cabbage, potatoes, onions, and winter squash, maintaining our peppers and beets, and generally staying on top of all of our most important farm chores. This collective effort from the community comes full circle in just a couple months when we start harvesting tons of food (literally) that wouldn’t taste as sweet if it hadn’t been raised with the help of friends and neighbors. Anyone interested in helping us #squashhunger can come to MFT’s Unity office at 38 School St. any Wednesday at 9 a.m. For more information, contact VFA’s Assistant Project Manager Khristopher Flack at kflack@mainefarmlandtrust.org.